At TED-Ed, we have the joy of working with all different animators from across the globe, and we thought it’d be fun to hear from one of our most prolific artists! Andrew Foerster has directed and animated 16 TED-Ed Lessons and is currently in production on his 17th. He’s a pretty busy dude, but he took the time to answer a few questions about his life as an animator — and share favorite facts he’s learned by animating TED-Ed Lessons. See his interview with us below. Andrew, what have you learned from animating TED-Ed Lessons? I love the diversity of the projects I get to work on! One month it might be a lesson about brain parasites, the next it might be an animation for a charity, or a personal project about a fight scene in the middle of the desert. There’s a lot of freedom in the work I do, which helps me continue to develop and always look forward to coming into work. How are TED-Ed Lessons different from other work you do? 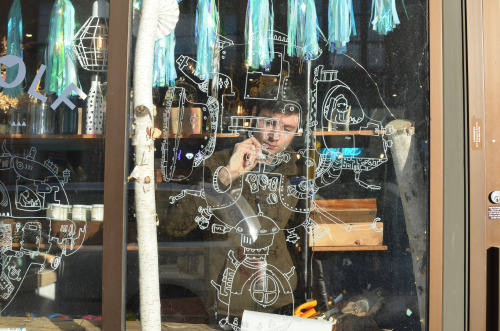 Andrew Foerster, drawing on windows. What’s a topic or a lesson you would absolutely love to animate? Where can we see your other work? I’ve got lots of work up on my website. One piece I’m currently working on is called Girl Wolf; it takes place in a post-apocalyptic world where people are nearly extinct, where one girl roams the earth searching for meaning and purpose after the death of her entire family. The film explores the disappearance of this character’s humanity as she transitions from living with purpose to living for the sake of surviving. You can check out development of that project here. Another fun piece I did in the summer and fall of 2014 is called Vonandalous Alchneminan: The Space Station of the Seven Stars. I created it over the course of 100 days, adding one compartment of the space station and one component of the story each day. It was a lot of fun to make; you can check out the whole story here. Who or what inspired you to become an animator? My mama! She was an animator for most of my childhood, and later went more into the production side of things. I’ve always loved animation and have been doing 3d, stop motion, and 2d animation since I was a kid. As I entered high school I moved away from animation and began to focus more on illustration. I attended OCADU for illustration, and in my last year I took Hector Herrera’s Animated Illustration class. (He’s also done many TED-Ed Lessons!) After Effects really resonated with me, and after school I began looking for more animation and motion graphics jobs. I found I really enjoyed the process and just kept rolling with it! in 2013 I began to assist Hector in the classroom to teach After Effects. Nothing lets you learn something faster than teaching it. What’s one piece of advice that you would give someone just starting out in animation? Make friends out of your mentors. Never stop learning. Do your research; find out what’s trending and who’s the best in your field. Always make time for your own projects and personal development. Thanks for taking time out of your busy schedule to talk with us, Andrew. We can’t wait to see what you make next! TED is a good project.